I am happy to announce that I was nominated by the amazing Bobby for the Sunshine Blogger Award. I feel so honored and honestly shocked that I would be nominated for anything! Thank you so much! 4. 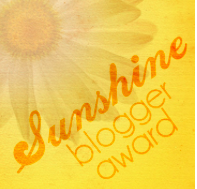 List the rules and include the Sunshine Blogger Award logo in your post. So let’s get started so you can learn more about me and check out some of the blogs that I feel definitely deserve more recognition. 1. What’s your future plan for your blog? I would love to continue putting out content to help others. I want to continue to do pieces with advice drawn from my own life. I have been pondering adding more lifestyle elements to the blog with clothing hauls/travel journals/etc. I would also love to make an Ask Column where people can ask me life questions and I can make a post answering them to the best of my ability. I just want to make more people smile. 2. Do you believe that the concept of “Blind Likes” exists on WordPress?I’m not sure what “blind likes” are, to be quite honest. 3. What do you like about my website ?My favorite series that you do is the slash because you effectively show the yin and yang of a certain topic. Your writing style is also the most captivating in those articles, I believe. 4. Is true love possible without “Real Communication” (means…..Just by texts or calls ?)Possibly. It depends on the type of person you are. If you need affection, then you can’t have a relationship based off of technology. But, if you’re a person who finds love based more on conversation, then you can probably find your true love that way. 5. Denim Shorts or Full Jeans?Shorts. I hate jeans so much. If I could fist fight an article of clothing, it would be jeans. 6. Pinterest or Instagram?Instagram for sure. It’s easier to navigate and has such a wider range of content. 7. What is the most weird thing about yourself ?I sleep with my eyes slightly open. I always have. 8. Describe one negative thing about my website ?I wish you had a way to kind of sort your articles into tags that you could find in an easy way. Like, if someone wanted to binge read your slash series, I think it would be nice to have a place where someone could find the tag and be able to stay in that certain tag. 9. Are you an Introvert or Extrovert ?I am an introverted extrovert. Which sounds odd, doesn’t it? I’ll write a blog about it pretty soon because it’s a rare thing for people to claim. 10. What are you passionate about except blogging?So many things. I’m passionate about helping others who have less than I do. I’m passionate about helping others grow into better versions of themselves. I’m passionate about the organizations I’m in. I’m passionate about doing things to better myself. 11. What is the definition of Imagination in your sense ? My definition of imagination is honestly just a blank space. Imagination isn’t about living up to the definition that is outlined. Imagination is about filling an empty space with your creativity. Imagination is about having the potential to do something amazing. What is your favorite piece you’ve ever written? What is your favorite song at this moment? (You can only choose one). Do you have any advice on how to grow my blog? What is your least favorite type of food? If you stuck with me for this long, bless your soul! I hope you enjoyed getting to know a little bit more about me/my plans with my blog. Leave a comment below and be sure to like and follow! And, as always, stay rad. It must be a genetic thing because my nephew does the exact same thing, I have no idea why! I’m excited to get to know you better, too! Great Response and answers… 👏👏👏👏.. Blind Likes are the likes when someone likes the other blogger’s post without actually reading it (just to get the attention). You’re too kind to me!! I just want to raise ur blog. So you deserve awards, so I am nominating you. I have nominated you for an another award…..
Love your definition for imagination!! Great responses! Thank you for the nomination 🤗 I will complete it soon! Thank you so much! I’m looking forward to see your answers! Lol I will totally help you fist fight jeans, I hate ’em too! I don’t do it every night but, my boyfriend has taken a photo of me sleeping with my eyes open a bit too! It’s creepy but I think normal? Lol. Anyways, thanks so much for nominating me. ♡ Can’t wait to answer your questions! I knew I could count on somebody to want to fight jeans with me! I think that it’s normal, maybe, because I do know of a handful of people who do it as well. And I’m happy to nominate you! I would love to learn more about you! I honestly don’t think I even own a pair of real jeans that fit correctly anymore. LOL. You are the sweetest!! ❤ Thanks again!! I loved reading your answers! I have never heard of someone sleeping with their eyes slightly open before. Do your eyes feel dry in the morning? I tend to breathe through my mouth slightly and my throat is always scratchy in the morning, lol. I don’t think they get dry! But I’m not sure how people who don’t sleep the way I do feel when they wake up! Thanks for the comment love! i can feel you on that.